In most of my previous contributions I focused on describing usually smaller tropical bird species, residents to the Bay area. This month’s article deals with a bird that is possibly their worst nightmare. The Grey Hawk (Buteo nitidus) is a medium-sized stocky bird of pray, rather common in our area. The adult is quite unmistakable in appearance. Its overall body color is gray, underparts are barred white, legs and cere are yellow. Juveniles are dark brown above, with creamy throat and underparts streaked brown. Grey hawks are usually perching high on branches, wires or telephone poles while scanning the surroundings for pray. They prefer forested habitats, but can also be spotted in semi- opened areas with scattered trees. In our area, they can be found throughout, but should you drive in between La Cruz de Huanacaxtle and Punta Mita, you are almost sure to spot a hawk or two sitting on the telephone poles flanking the road. 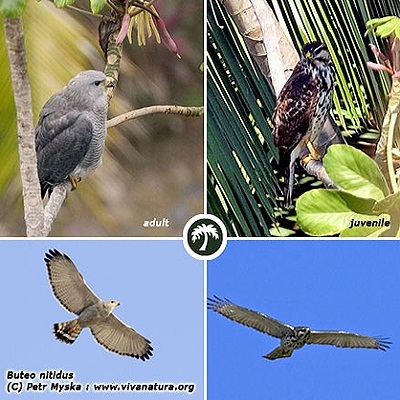 Grey Hawks range from SW USA, through both Mexican coasts down to Central and South America as far as Argentina. They are non-migratory lowland residents to the Banderas Bay.